It is true that this eccentric man and his work have been harshly criticized. But there is no doubt that Antoni Gaudi has left his mark on Barcelona and the world. Perhaps he was a madman, but he also was bold and way ahead of his time, a genius who created magnificent and unparalleled works of art that today are recognized by UNESCO as World Heritage. No one can experience his work with indifference. 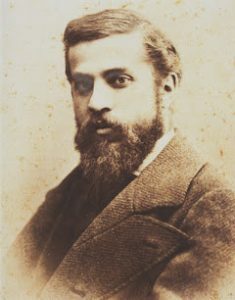 Born in 1852 in the small city of Reus on the northern Mediterranean coast of Spain, Antoni Gaudi i Cornet was a Catalan architect who practiced modernism. He was the son of a boilermaker of modest means and a frail child, frequently ill and requiring rest and recuperation at the family’s summer cottage. In his mid-twenties, Antoni went to Barcelona to attend the Provincial School of Architecture. He was not a particularly good student and sometimes failed courses, but his special aptitude for architecture was evident early on. It took him eight years to get his degree because it was interrupted by military service and other diversions. He was a highly religious man who got his inspiration from God and nature. His work incorporates these passions. Gaudi never married; some say his “mistresses” were nature and his work. He was one of the fortunate artists to achieve success and recognition during his lifetime and was on commission to design most of the projects we enjoy today. As Gaudi aged, he became withdrawn and did not take care of his personal appearance, he ate little, distanced himself from friends and society, and devoted himself ever more fervently to his religion and mysticism. Gaudi died in 1926 as a result of a tram accident that knocked him down as he was taking his evening stroll to Sagrada Familia. At first, this comatose unkempt old man was taken for a vagrant and not recognized as the famous architect until the priest from Sagrada Familia identified him. He died two days later and was buried in that very church. He was 73. Today he is being considered for sainthood. Gaudi brought a unique approach to the Art Nouveau movement. 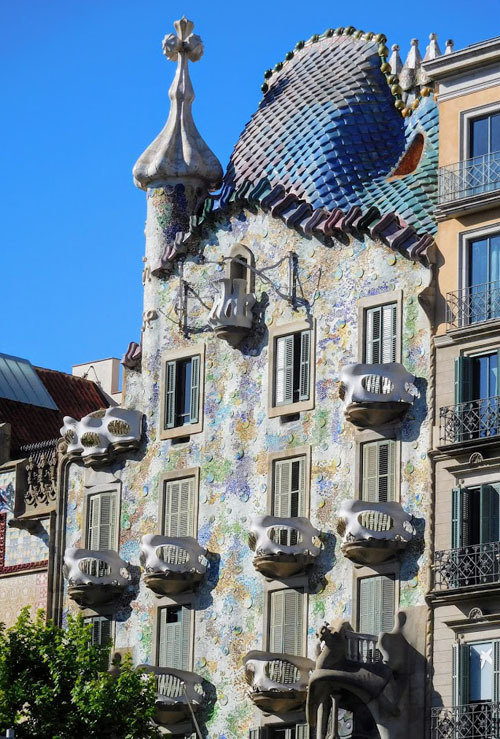 His Catalan modernisme incorporates ceramics, stained glass, stone, forged iron, and fine woods and carpentry, and his buildings are more art and sculpture than architecture. The irregularities of the natural world are featured throughout—in his undulating rooftops and facades and in his crooked windows and doors, balconies that look like the “masked” faces of raccoons, broken ceramics that are the colors of natural coral, and “forest” of giant marble trees that provide for a breathtaking walk in the “woods”. 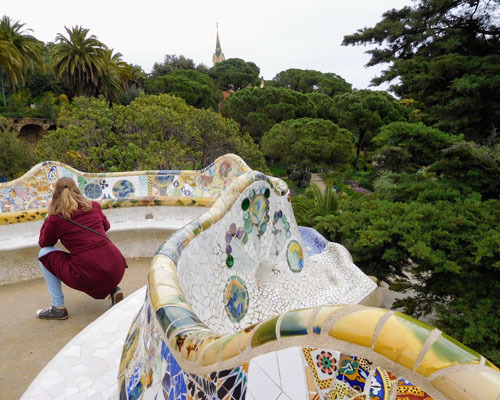 One of Gaudi’s specialties is trencadis, the use of small pieces of broken tile and ceramics, often disused objects taken from demolition sites, that are applied to surfaces like mosaics. Another is the play of light and shadow. 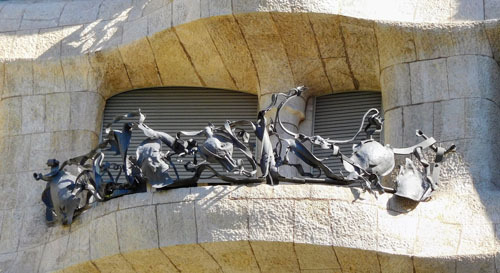 On a sunny day, the walls of the inner courtyards of his two houses on Passeig de Gracia in Barcelona and the small “hooded” windows just below the rooftop of Casa Mila cast shadows that are magnificent. Among the most famous and most visited are the following projects located in Barcelona. All provide breathtaking visual experiences. Visit them and then decide for yourself: tourist traps or treasures, madman or genius. This large unfinished Roman Catholic church in the heart of Barcelona has been in the works for well over a century. 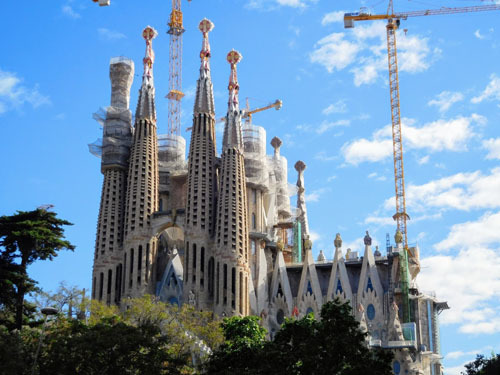 Construction started in 1882 when Gaudi was 30 years old and is expected to be completed by 2026, marking the centennial of his death. It will have taken 144 years to build. Critics say that the entrance fees collected to fund the construction would have been better spent if they had instead been donated to Christian charities. Only a small portion of the project was completed during Gaudi’s lifetime—part of the nativity facade, the crypt, and the apse. His assistant took over when he died, and since then, the work has been undertaken by crafters and architects according to Gaudi’s plans and models. Its full name is the Basilica and Expiatory Temple of the Holy Family and it is Gaudi’s best-known and most frequently visited masterpiece. It is a breathtaking “inside-out” structure, a reversal of traditional architecture. Stories from the Bible told through statues, paintings, and carvings that you typically find on the inside of a traditional church are sculpted on three outside facades of this church. One side, facing the rising sun in the east, is devoted to the nativity. 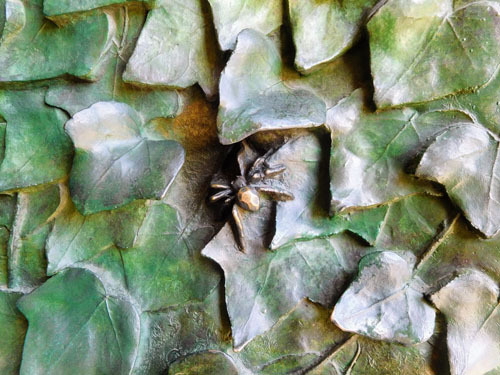 It features classical sculptures and stories about the birth of Christ; every surface is covered with statues, vines, flowers, fruits, insects, and animals. Another side faces the setting sun in the west and is devoted to the passion. This side is shockingly harsh, simple, and stark to depict the suffering and death of Jesus. And the third side is still unfinished. It is dedicated to the glory of God and will have gigantic trumpets and images of heaven, purgatory, and hell. The interior of the basilica looks like a forest. “Trees” made from pillars of colored marble soar toward the rooftop. Rays from the sun shine through blue and green stained glass windows on the nativity side and bring to mind a summer woodland. In the west, the passion side, are the oranges, reds, and yellows of autumn and end of day. In 2005, the nativity facade and crypt of Sagrada Familia were recognized by UNESCO as World Heritage. More commonly called “La Pedrera” from the Catalan word meaning “quarry”, Casa Mila is a residential apartment and office building with a mammoth stone facade. It was constructed in 1906-1912 for the wealthy Mila family and was recognized by UNESCO as a World Heritage Site in 1984. It was one of Gaudi’s last buildings before he dedicated himself exclusively to Sagrada Familia. The facade uses simple undulating stone surfaces punctuated with twisted iron balconies and a Gaudi-esque rooftop. A spectacular interior courtyard that is eight stories high provides additional lighting for the apartments. 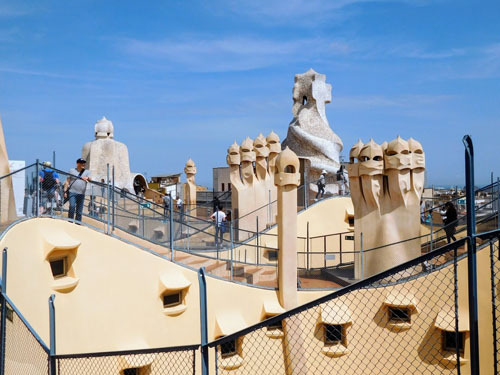 The rooftop is iconic and one of Gaudi’s hallmarks. He felt that the functionality found on rooftops does not have to be ugly, so he set out to find decorative and ornamental solutions, not only in Casa Mila but also in many of his other projects. Here his chimneys look like giant hooded guardsmen with big eyes and the ventilation function is housed in interesting stone and tiled mosaic structures. You can take an elevator up to the rooftop and are free to climb up and down the “hills” amongst the guardsmen. There are great views of Passeig de Gracia and Barcelona’s rooftops from up here. This deliciously creepy house located in the Eixample district of Barcelona was built between 1904 and 1906 for industrialist Joseph Batllo. It served as his family home and also provided income-producing rental apartments. As the structure was being built, its radical design broke all of the city’s bylaws and accommodations had to be made. 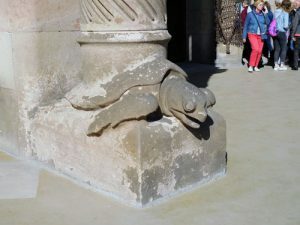 Gaudi’s love of nature comes through here too. The shimmering colorful face has a striking blue slanted roof and a facade constructed from mosaics that use colors from marine life and coral. The unusual balconies resemble raccoon faces. And the windows on the main floor are supported with femur-like columns and stained glass that is the color of the sea. Joseph Batllo and his family lived on the two lowest floors. The rental apartments face the street and a beautiful pale blue tiled courtyard. 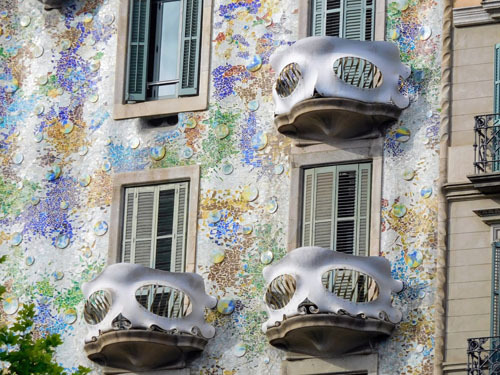 Windows on the upper floors are smaller than those on the lower floors since they are closer to the sunlight—Gaudi wanted to provide uniform lighting in all the units. There is an underground parking garage for the tenants and a turret topped with a Gothic cross next to the slanted roof. This is a magical place, a fantasy right out of a fairy tale. You will find trees and flowers, hilly walkways, a colonnaded wall and tiled staircase, colorful serpentine benches on a terrace, a giant salamander made from broken pieces of ceramic, and two Hansel and Gretel cottages at the entrance that originally were the porter’s lodge of the estate and today house a museum and a gift shop. The gift shop is topped with a ceramic-clad steeple with a cross on top, a symbol of Gaudi’s deep religious faith. 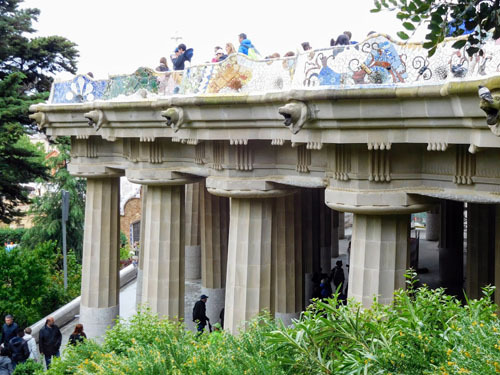 Built between 1900 and 1914, the garden and park complex was ordered by Count Guell who wanted to build a small city-like project in the hills outside of Barcelona’s center. The project was never completed according to the original plan and some of the houses that were planned for the hillsides were never built. But it is stunning nevertheless. The site has been recognized by UNESCO as World Heritage. It is located on the outskirts of the city and there is a convenient metro line that will get you there. Be prepared for a steep uphill hike. Basilica La Sagrada Familia. Main entrance is at the Nativity Facade on Carrer de la Marina. Open 9am-6pm in winter and 9am-8pm in summer. Euros 15-35. “La Pedrera” (Casa Mila), 92 Passeig de Gracia (at junction of Carrer Provenca), Barcelona. Summer hours 9am-11pm. Euros 21-45. Casa Batllo, 43 Passeig de Gracia, Barcelona. Open 9am-9pm. Euros 24,5-39. Park Guell, Calle d’Olot, Barcelona. Take green line Metro to Lesseps and walk up from there. Summer hours 8am-9:30pm. Euros 7,50-8,50. Majestic Hotel and Spa at 68 Passeig de Gracia, or Murmuri at 104 Rambla de Catalunya as a less expensive alternative. 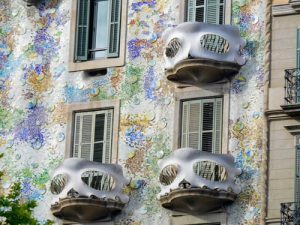 Both are well located within two or three blocks of Casa Mila and Casa Batllo, and walking distance of all other major sights. Enjoy tapas at any of the sidewalk cafes along La Rambla de Catalunya and at tabernas throughout the city. One particularly appealing taberna/cafe is Txapela—it offers 51 different kinds of hot and cold tapas and has numerous locations throughout the city. Elizabeth von Pier is a retired banker and an avid traveler, photographer and writer. She has been published in the Los Angeles Times, GoNomad, Travel Thru History, and various online magazines. She recently published her first book, “Where to Find Peace and Quiet in London.” Ms. von Pier lives in Hingham, Massachusetts.